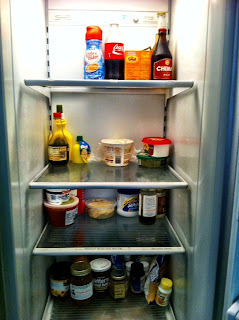 two days after going to the store -- sigh. Yes, that's right. I'm unbearably lazy and selfish. I have been neglecting you, poor blog, because I have waaaaaay too much to do -- what, with my exuberant workouts, my stimulating coffee interludes, and my tireless grocery shopping. And while we're on the never-gets-old subject-of-groceries-because-there's-nothing-more-fascinating, I am CONVINCED that a homeless person is sneaking into our house at night and stealing our food. I don't understand it -- I go to Kroger on Monday, buy shitloads of produce, cheese sticks, and goldfish varieties, and then by Wednesday everything's gone, all gone. It's actually kind of depressing. There's nothing worse than going to the grocery store three times a week -- although my friend, Amy, puts on her sunglasses and i-pod at full throttle and pretends like she's in a movie (whatever kind of movie shows an almost-40-year-old-woman grocery shopping with an i-pod and sunglasses on -- oh, that's right, a thriller). I have, myself, also tried doing this, but I'm just not coordinated enough to grocery shop and listen to music at the same time. I knew it was a problem when I was so in the zone that I accidentally rammed my cart into the Pillsbury section (my favorite!) and subsequently found myself bobbing up and down in time to the music while simultaneously picking up tubes of chocolate chip cookie dough. I'm pretty sure the dairy guy over in the next aisle thought I was, um, special. The other thing is, I'm transitioning. No, not from a female to a male, or from an apple to a kumquat (although some days I could swear I'm a kumquat), no I'm transitioning from a girl who occasionally posts on a blog, to a girl who does absolutely nothing productive at all. Just kidding! Seriously, I AM going to try to get published in book/magazine form, although I've submitted a few things so far, and have subsequently learned a) that it's really, really hard to do, b) that I absolutely LOATHE rejection (I mean, who doesn't? ), and, c) that offering the editors lollypops and/or sexual favors does absolutely nothing to better your chances (who knew?!). But, the good news is that I've garnered enough feedback from this blog-writing experience to know what works and what doesn't -- well, for my writing-type, at least. For the most part, people want funny. I've posted a few serious essays, and those went over like liverwurst pancakes -- most people just don't "get" them, but then there are those special few (and you know who you are!) that think they're fabulous. I think that, for me, being humorous on the surface while having an underlyingly pedantic, er, meaningful theme seems to be the most popular with my readers. And, what's funny is that is exactly how I would describe myself: silly on the outside, but serious underneath. This blog has been a sort of launching pad for me. Through writing it I found my voice (ridiculous as it sometimes may be) and I became comfortable sharing it with the world. "Who's Your Mommy?" became a quest for me -- who was I??? And now I can finally say I know truly who I am and what I want, which is, obviously, to be a piece of Entemann's coffee cake on its way to Ryan Gosling's mouth. Well, that, and also to be a wonderful mother, wife, writer, friend, healer, and woman. And while I may start posting fewer and fewer blogs and poems, just know that I AM still writing, and that, who knows? Maybe, just maybe, one day I'll have my very own kumquat tree. Oh, no! I meant...book! I command you to write in your blog once a week. You are that good of a writer. And then get sessions on how hard it is not to doubt your talent, worth and level of competence. Any voice in your head that says any of these things to you is only trying to protect you from fear of rejection. Go for it Sarah! You are worth it - very very talented - AND extremely competent.